Universal Blu-ray players are here at last (or very soon to be). Previous Universal DVD players were ones that were true universal players. They would play CD’s, DVD video, DVD-Audio, as well as Super Audio CD. When Blu-Ray players came out, many were in eager anticipation for the new Holy Grail of a player – a new universal player that would play all of the previous formats as well as Blu-ray movies. The wait is now almost over, thanks to Denon and Oppo Digital. Both Denon and Oppo Digital have one player each to be coming to market. For Denon it is the DVD-A1UDCI, and for Oppo Digital it is the BDP-83. The Oppo Digital BDP-83 is one impressive unit. Not only will it be a universal player, but it will also offer Profile 2.0, VRS by Anchor Bay video processing, and internal decoding for Dolby TrueHD and DTS-HD Master Audio. There is also high definition HDMI scaling, edge and detail enhancement, and 1080p/24Hz output for both DVD and Blu-ray. On the audio side come a refined audio stage, discrete stereo outputs, and increased power and efficiency in the power supply. The BDP-83 will also be able to do direct DSD over HDMI and DSD-to-analog without any PCM conversion. The price is estimated at $499-$599 and is scheduled for release in the 1st quarter of 2009. For those that need well, a bit more, there is the Denon DVD-A1UDCI. The price is a lot more at $3800. For the extra cash you will get 10-bit video processing from the Silicon Optix Realta chipset that is famous for its quality. The audio side is handled by the Advanced AL32 processing which does digital upsampling from 16 to 32-bits. For those of you that are familiar with it there is also Denon Link. This unit is built like a tank and very heavy. The DVD-AUDCI is the epitome of quality, and is scheduled to be available in February 2009. In our modern day, we can use the internet for everything and access it anywhere. It started in our homes on our computers, then on our PDA’s and from there to our cell phones. Now our alarm clocks can access the internet to help make our lives more convenient. Up for review is a wonderful device from La Crosse Technology. 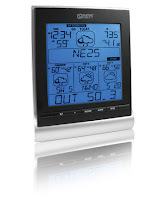 It is the Wireless Weather Station model #WD-3209U by Weather Direct. The Weather Station #WD-3209 is a wonderful device. Not only does it have an alarm clock, but it also uses Wi-Fi to connect to the internet to get local weather information. And it was very easy to set up. It comes with an antenna that gets hard wired to your router. You connect to the internet to register your device and program it with the nearest location to you from a choice of 40,000. So chances are your city is on the list. It also comes with a wireless adapter that you keep outside to monitor the outside temperature wirelessly. Your base station will communicate with both the adapter outside and the wireless adapter that connects it to the internet. And now with it all set up, not only will you be able to monitor the outside temperature, but you will also have your local forecast right in front of you. You will get forecasts for morning afternoon, and evening with daily high and low temperatures. Not only will you get forecasts and temperatures for the current day, but it provides a 4 day forecast. There are multi-line toggles that will give you chance of precipitation, rain amount, sunshine forecast, barometric pressure, and wind gust/speed/direction. It also tells you the time for sunrise and sunset. You can even program it to notify you with text messages or email alert or just audible alarm from the wireless display if the chance of rain/snow, hi/low humidity, or hi/low outdoor temperature is outside of your desired range. All in all, it is a great device. And it works as it should. Weather Direct makes a great high quality product. If you are in the market for this type of product I highly recommend them. For complete specs and more details, feel free to check out their website at www.weatherdirect.com.